“The Industry”? Is that a restaurant? 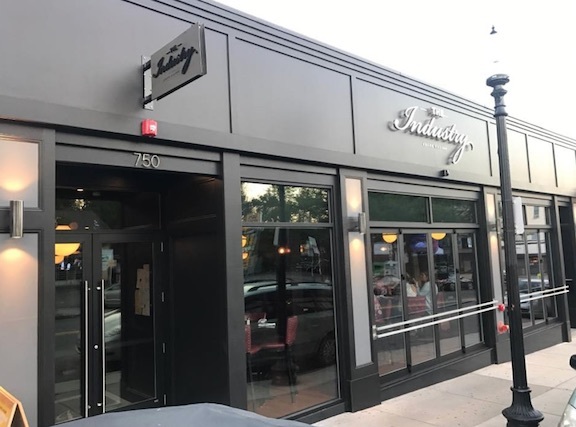 Yes, indeed; it’s Dorchester’s newest restaurant. Barbara and I decided to try it out last night. All in all — two thumbs up. Fortunately they have valet parking (in the gas station across the street), since Adams Village is always crowded and no one is allowed to park in the large parking lot behind the restaurant. (But that’s another story.) So it was easy in, easy out. The next thing we noticed was the exceptionally comfortable chairs — another good sign. But what about the menu? You do want to know about the menu, right? Well, there was one small problem with the menu. Usually when I go to a new restaurant I find two or three entrees I really want to order, which makes it a relatively easy choice. But at The Industry I wanted to order everything on the list of entrees! There wasn’t a single item there that I didn’t think I would love That was a real problem. I guess I’ll have to come back (not that I wouldn’t want to anyway). Be patient now. Before we get to the entrees, we have to start with the starters, of course. I had a huge bowl of French onion soup — delicious and properly made. Barbara had half a dozen raw oysters, which she says were delicious but unfortunately they weren’t fully cut through, which made them hard to eat. She also reports that the mignonette was scrumptious. So now I’ll tell you about the entrees. Barbara ordered surf and turf, which included a filet mignon that turned out to be considerably bigger than she had expected (are you starting to detect a theme here? ), a Duxbury lobster tail, mashed potatoes, and grilled wild mushrooms which Barbara substituted for the advertised asparagus as we had been having too much asparagus recently. The filet was definitely cooked rare as ordered, and the lobster tail was equally excellent. My entree was the seared diver scallops — six huge ones (are you continuing to detect a theme here?) — accompanied by corn pudding and a corn, bacon, and mushroom succotash. All of this was outstanding. Service was friendly, efficient, and well-informed. The knob to the handicapped bathroom was hard to open and release, and the trash can required stepping on a lever in order to open it — an impossible task for someone in a wheelchair. It’s pretty pricey — about twice what we would normally spend. (Admittedly, we ordered expensive items.) It seems like a neighborhood restaurant, but it’s closer to a special-occasion one. Anyway, there you have my two cents’ worth. We’ll be back. But it will never replace the Ashmont Grill, our regular Dorchester restaurant where everybody knows your name.